Indigenous peoples from around the world came together to examine the relationships between people and nature at the IUCN World Conservation Congress in Hawai'i. They discovered that in many indigenous or native worldviews people are not seen as separate from nature - as reflected in many local languages, writes Seline Meijer from IUCN's Global Economics and Social Science Programme. Sharing experiences about the role of indigenous and local knowledge in restoring interrelations between people and nature was the focus of a Conservation Campus organised by IUCN's People in Nature (PiN) initiative during the recent IUCN World Conservation Congress in Hawai'i, in collaboration with the Hawaiian non-profit organisation Kuaʻāina Ulu ʻAuamo (KUA). The event brought together participants of the IUCN Congress from around the world and people associated with KUA to talk about the role of nature in the restoration of land- and ocean-based relationships and reconciliation between peoples. Surprisingly, many people with native or indigenous backgrounds feel uneasy about the way Western discourse separates these as two discrete concepts. 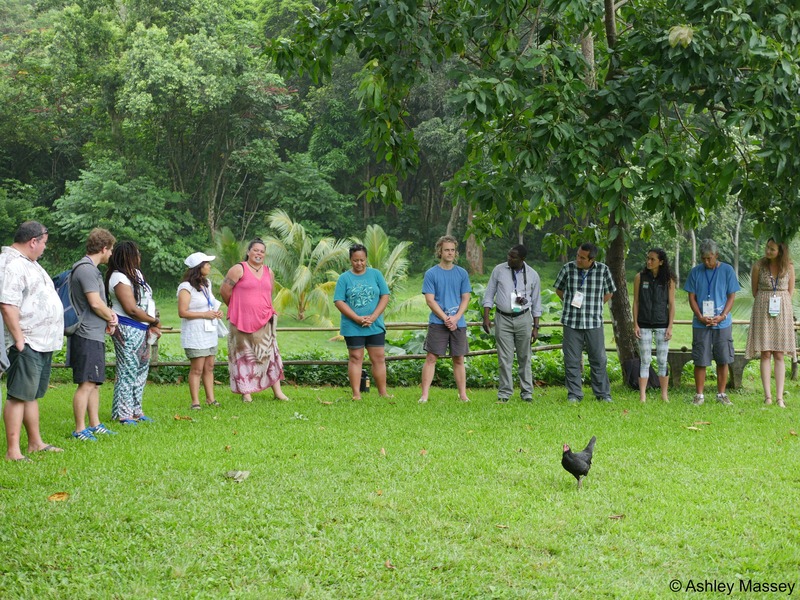 "Nature and people are not two separate things, they are the same: nature is people and people are nature" - was how one of the participants of the Conservation Campus put it. This was reinforced by Tina Ngata, a participant from Aotearoa, New Zealand: "If you ask me the value of nature for my well-being it's like asking me the value of my head for my well-being. It doesn't make sense." The perspective that nature and culture are not just interlinked, but that they are inseparable, is shared amongst many native and indigenous worldviews. For indigenous groups, it is often difficult to talk about issues related to nature outside of the context of their people, which is reflected by the way these concepts are translated into language, songs and creation stories. The Māori language uses terms for nature and human elements interchangeably. For example, Ko wai au has the dual meaning of who am I and I am water. Similarly, the word for land, whenua, is also the word for placenta. "Our genealogy extends beyond humans to include our insect, animal, plant and element cousins", explains Tina Ngata. "I say cousins because we all also share the common ancestor of our Earth Mother Papatūānuku and Sky Father Ranginui." The Māori world is replete with examples of how people come from, depend on, and are nature. "Such examples are everywhere, from belief systems, to genealogy, to songs, food, language, architecture, art, recreation and kinship structures," says Tina Ngata. "All of it is embedded in our interdependent membership of nature." A lack of distinction between people and nature is a worldview common to many other indigenous groups. For example in the language of the indigenous Bribri people that live in the Talamanca region in Costa Rica, the word ditsö, the name given to the Bribri people by their creator and which literally translates as seed, clearly expresses the lack of separation between nature and culture. Alí García Segura, linguistics professor at the University of Costa Rica and Talamanca Bribri community member, explains that the Bribri believe that they are one seed among many others: "We understand seed as the essence of life, whether this life is manifested in a tree, an animal, in water or in a human being." Similarly, an existential foundation for Native Hawaiian people is found in their creation stories and genealogical chants. A notable chant, translated by the Queen Liliʻuokalani soon after the US overthrow of the nation of Hawaiʻi, the Kumulipo, was shared by the hosts of the Campus. According to the chant the Hawaiian people descend from the meeting of Wākea and Hoʻohōkūkalani (father sky and daughter of mother earth) whose first child was still born. The still born child was buried and grew into the first taro plant, the staple food of the Hawaiian people. Wākea and Hoʻohōkūkalani's second child, Hāloa, was the first man and he was born with eternal kuleana (right and obligation) to care for his elder brother the taro. "A common Hawaiian phrase that embodies a similar sentiment is 'He aliʻi ka ʻāina, he kauwa ke kanaka' - 'the land is the chief and man is its servant.' When we take care of our resources they also take care of us," Kevin Chang of KUA explained. The dialogue of the Conservation Campus built on the E Alu Pū (Move Forward Together) Global Gathering organised by KUA prior to the Congress. E Alu Pū is a network of Native Hawaiian and rural community members who come together to learn directly from one another on how to better care for the land. This time the gathering also had international participants, including indigenous and community leaders, practitioners and researchers, to share experiences and learn from each other on caring for their lands and waters ahead of the IUCN Congress. Set in Waipao on the island of Oʻahu, the Conservation Campus took participants off-site to Papahana Kuaola, a local non-profit organisation working to connect the area's past with a sustainable future. The aim of PiN is to document and better understand the interrelationships between people and nature. The dialogue started during the E Alu Pū Global Gathering and the Conservation Campus will enrich and inform the approaches used to better articulate these relationships and use this knowledge to sustainably manage natural resources. If you are interested in learning more about the work of PiN, take a look at the PiN website or get in touch if you would like to become involved.